Any organization needs to have a strategy and respective strategic goals, however, on most strategy maps the focus is on incremental operational objectives that can rarely result into sustainable profitability. “Strategic” is something from the world of top managers, defined for a longer-term, often less tangible, but still very important. Can we call “15% increase of the market share” a strategic goal? Is “Implementing new technology” strategic or operational? 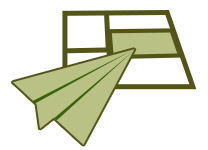 Is strategic/operational defined only by planning horizon or by something else as well? In order to answer these questions and have a point of reference for the following discussion, we can build a checklist that compares a “strategic” goal vs. an “operational” one. 1 Doing things differently. Doing the right things. Doing things better. Doing things right. 5. Sustainable advantages. Long-term profitability. Best practices. Short term profitability. If you have more ideas for the checklist feel free to share in the comments! 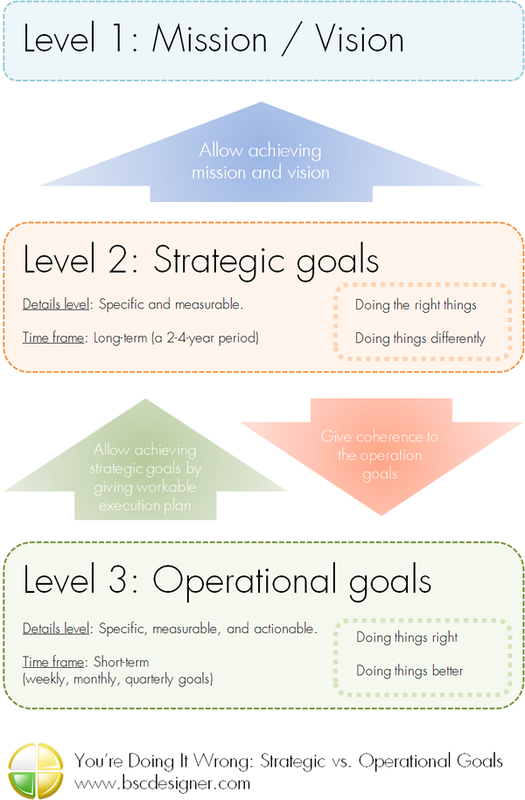 How to Find Out if the Goal is a Strategic or an Operational One? Is a Strategic Goal Aligned with the Company’s Mission/Vision? Just because “Improving customer support service during 5 years” is a long-term broad goal, it doesn´t make it a strategic one! Does improving customer support service lead a company to where it wants to be in its dream-future? That’s a good question to ask. What if the answer is “No, it is not aligned with our mission/vision!” (like on the strategy map for IT above). Then this is not a strategic goal, at least not for your organization. Does a Goal Require Incremental Improvement or a Critical Change? Another thing that we need to look at is the degree of the change that the goal implies. 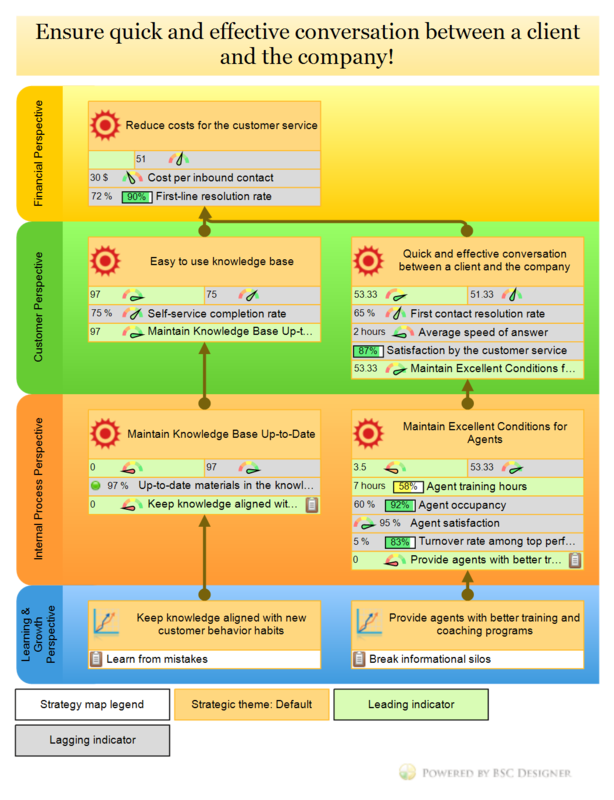 Let´s take “Goal B: Answering customer queries faster” as an example. What exactly stands behind this goal? Is it about training some additional staff and adding more articles into the knowledge base, or it is about re-investing the whole idea of customer support? The goal, as it is formulated now, is not specific enough to answer these questions. For an international company with a complex structure and a certain way to do things the same goal might result in radical changes in the organization, and will be more than strategic. For sure, we are not talking here about outsourcing everything to a cheap call center. That’s what happened to Nokia’s mobile phone business: the company produced great phones, the design was nice, the battery lasted for a 1 week, there was no need for a protective case… but it has missed the smart phones market. […] rarely are “best practice” advantages sustainable. From some point of view his approach to the business might look like incremental changes (focusing on quality, reducing costs, reducing prices), but behind these operational goals there were a bigger strategic one that gave a sense to all other operational objectives. That´s a positive example of how good a strategic goal works. Another positive example is the focus on safety is Alcoa company that gave a sense of direction to all supporting operational goals. In their case, achieving highest safety levels is a great strategic goal. It is achievable. You know how to divide it into smaller operational goals, or at least where to start. We discussed the difference between operational and strategic goals. Probably, you already have a long list of the goals of both types. So, what’s next? A strategy helps to filter goals that don’t fit, and it gives coherence to the ones that are left. Do you already have a strategy for your business? Keep reading and make a short self-test for your organization, probably there are things that you can improve. Having 100+ goals on your list doesn’t make them a strategy. A strategy might be just one simple idea about what you want (or don’t want) your business to be like. The purpose of the strategy is to give your team a shared vision, and explain how you want to achieve it. Phrases like “leveraging growth opportunities via leadership” make goals sound smarter, but they don’t help with a strategy formulation and execution. Some goals are just not big enough for the business in the long term. Attract funding from a venture funds and create another Uber. Normally, you cannot do all this at the same time. A strategy brings some systematic approach to this chaos. What do our stakeholders want? What value do we create or could create for our clients? How do we make money? What threats and opportunities are there (a good old SWOT)? Why are we in the current situation? What constraints do we have? What do our competitors do? What are our priorities, goals, and how are they connected? There are various frameworks to describe a strategy, and for sure Balanced Scorecard is one of the best and recognized. 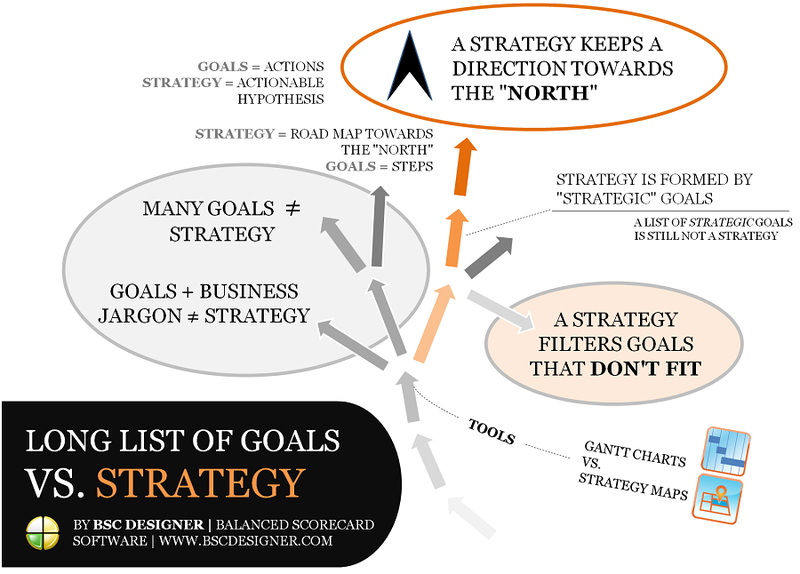 The most valuable part of the BSC approach is a strategy map – make sure you have a good one for your strategy. Having 80+ pages document and calling it “Organization’s strategy for 2050” is fine, but consider making an “executive summary” version of this document as well. 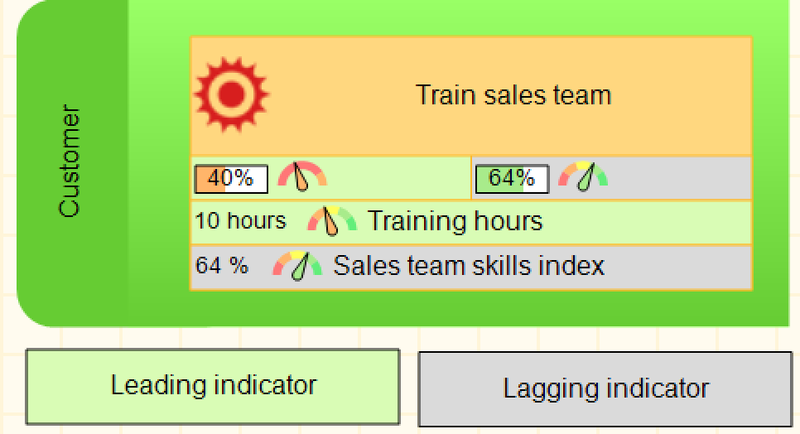 You can create a prototype of a strategy map in any office software, but for a real project I’d suggest using professional software like our BSC Designer. Start with office tools, etc. After a year or so, migrate to a scorecard automation tool. What about keeping goals in order? The tool might be as simple as a list of things to do, or a professional project management software will Gantt charts and other useful functions. Once more, before searching a software tool, get a clear understanding of what you are actually looking for. A typical confusion that we discussed before is when people are looking for strategy execution software, when they actually need a simple project management tool. When we have a list of goals, in the many cases we have in mind a specific set of actions with the expected results. In a case of strategy, we have a number of hypothesis that we want to try. Those hypotheses are for sure actionable, but the results are not guarantied. That’s why there are leading and lagging metrics aligned with most goals on the strategy map. Leading metrics help to quantify our actions, while lagging metrics help to validate achieved results (validate the hypothesis). An Example of Contextual Indicator online - sign-up with a free account for immediate access to 16 scorecard templates. What was the purpose of designing a strategy? That’s a good question! Didn’t we create another document that will be used at annual meetings only?! I hope this won’t be the case! Thinking about a strategy, a good analogy might be a history of writing. People were able to communicate before writing, moreover, they were able to share their ideas across generations, but having a formal way of writing multiplied the efficiency and effectiveness of the knowledge they were sharing. A similar change happens in an organization that created and implemented a good strategy map. The organization was able to work before without a strategy map or KPIs, but having a good strategy map helps to explain strategy to all the employees (find some facts here for a case you need to convince your boss), and helps to understand the priorities. Feel free to share your thoughts in the comments block below or ask some follow up questions. This quote gives an interesting point of view on the balance between strategy execution (traveling in this metaphor) and strategic planning. What do you think? Share in the comments!